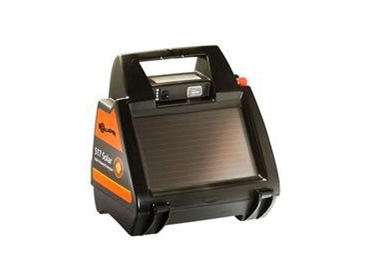 Farmerswarehouse offers generic and brand name farm equipment at discount prices, including the portable S17 solar energiser suitable for powering up to 1.5km of multi-wire electric fencing. With 0.17 joules of stored energy, the S17 solar energiser provides ideal solar power operation for remote locations or for permanent installation on small farms. An economical unit, the S17 solar energiser features built in solar panels that charge the 6 volt rechargeable battery for reliable continued performance, even on cloudy days. This solar energiser can be mounted on top of a Y-post, or can hang on a wooden post or barn wall, and an indicator light flashes with each fence pulse to signal at a glance that the energiser is working. Using any type of fence wire, including poly wire, tape and poly rope this solar energiser is ideal for temporary fencing for gardens and pets. The S17 solar energiser features a weatherproof and UV resistant plastic case for maximum durability and protection against insects. The entire unit is compact and portable.